6 And while they were there, the time came for her to give birth. 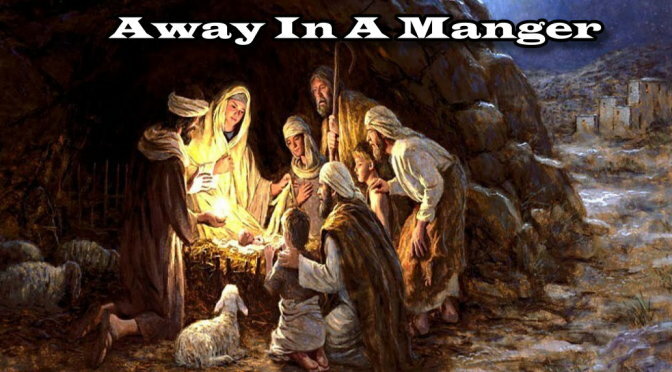 7 And she gave birth to her firstborn son and wrapped him in swaddling cloths and laid him in a manger, because there was no place for them in the inn. The King of Kings and Lord of Lords is born in a manger with not so much as a bed to lie on. The humble beginnings of our Lord’s life remind us that we are to be humble and thankful for what we have been blessed with. The true meaning of Christmas is reflected so poetically in the story of Jesus’ birth that we cannot help but find ourselves grateful for all that was given to us on that day. The song describes how even when Jesus wakes, he does not cry out or make a sound. This day was a day of rejoicing, and the baby lying awake on the hay was no ordinary child, He was the Savior of men! The last verse of the song asks the Lord to stay beside us, to lead us, and to eventually take us to Heaven to live with Him. How often is that our prayer? Stay beside me Lord as I make my way through this earthly life. How glorious and beautiful is the birth of our Lord Jesus Christ. We celebrate His birth and the life that was given to us by Him through His life, death, and resurrection. Why do you think God chose for his son to be born in a manger instead of a birth fitting of royalty? Dear Lord, we ask You today to stay beside us as we make our way through this earthly life. In the Name of Jesus, Amen.